40 | TH E M R EP O RT O R I G I NAT I O N S E R V I C I N G A NA LY T I C S S E C O N DA R Y M A R K E T ORIGINATION THE LATEST Trustworthiness Is a Valued Trait in Loan Providers More than half of all buyers list trustworthiness as the most desirable trait in a loan provider, with experience also ranking high. W hen it comes to taking out a mortgage loan, more than half of all first-time homebuyers want to work with a company they con - sider trustworthy. That's accord- ing to a recent Bank of America Homebuyer Insights Report, which the financial institution released for the first time in May. The report found that 63 percent of first-time buyers found trustwor- thiness the most desirable quality in a loan provider. That was also an important element for 56 percent of experienced homebuyers asked the same question. At 59 percent, the same amount of first-time buyers as experienced ones preferred lenders who could furnish the right rates. A little more than a third of first- time buyers preferred referrals when doing business, compared with 28 percent of experienced shoppers. More experienced buyers than first-time ones considered a loan officer's accessibility and whether they'd already worked with a mortgage lender. According to the report, more than nine in 10 homebuyers considered saving for a home important, with a full 85 percent of survey respondents interested in a tool that would help them automatically save for home purchases. Interestingly, millennial home - buyers expected help from their parents when securing a mortgage, with two thirds expressing interest in their financial assistance. "The reality is that many buy- ers today are balancing impor- tant financial priorities," said D. Steve Boland, Consumer Lending Executive for Bank of America. "And they are considering all of this while they are coping with student loans, credit card debt and college savings for their children." Two-thirds or more of all first- time and experienced homebuyers were primarily interested in find- ing a single-family residential home in the suburbs. Bank of America also found that those homebuyers who budgeted ahead of time encountered fewer surprises and seemed generally more satisfied with outcomes. About four-fifths of these buyers felt comfortable with their mortgage products, the overall costs, and the stress and length of the process. "In many cases, we found to- day's buyers are taking a long-term view of homeownership," Boland added. "They want to purchase a home that will meet their future needs and understand that, in some cases, that will require saving more, waiting longer and making sacrifices." FHA Appraisal Policies Cause "Confusion and Delays" The FHA's updated appraisal guidelines "blur the lines" between appraisals and home inspections, according to NAR. W hen the Federal Housing Administration (FHA) announced numerous changes to its Single- Family Housing Policy Handbook last year, many in the industry, including real estate agents and appraisers, were confused about the lack of clarity between appraisals and inspections. 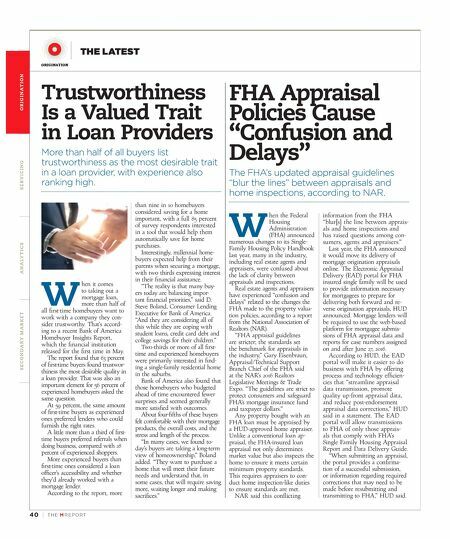 Real estate agents and appraisers have experienced "confusion and delays" related to the changes the FHA made to the property valua - tion policies, according to a report from the National Association of Realtors (NAR). "FHA appraisal guidelines are stricter; the standards set the benchmark for appraisals in the industry," Gary Eisenbraun, Appraisal/Technical Support Branch Chief of the FHA said at the NAR's 2016 Realtors Legislative Meetings & Trade Expo. "The guidelines are strict to protect consumers and safeguard FHA's mortgage insurance fund and taxpayer dollars." Any property bought with an FHA loan must be appraised by a HUD-approved home appraiser. Unlike a conventional loan ap - praisal, the FHA-insured loan appraisal not only determines market value but also inspects the home to ensure it meets certain minimum property standards. This requires appraisers to con - duct home inspection-like duties to ensure standards are met. 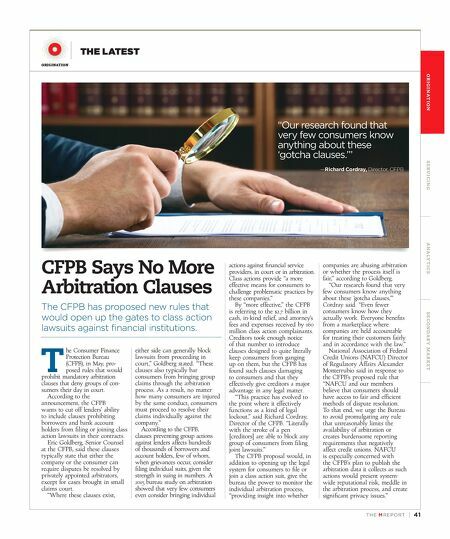 NAR said this conflicting information from the FHA "blur[s] the line between apprais- als and home inspections and has raised questions among con- sumers, agents and appraisers." Last year, the FHA announced it would move its delivery of mortgage origination appraisals online. The Electronic Appraisal Delivery (EAD) portal for FHA insured single family will be used to provide information necessary for mortgagees to prepare for delivering both forward and re - verse origination appraisals, HUD announced. Mortgage lenders will be required to use the web-based platform for mortgagee submis- sions of FHA appraisal data and reports for case numbers assigned on and after June 27, 2016. According to HUD, the EAD portal will make it easier to do business with FHA by offering process and technology efficien - cies that "streamline appraisal data transmission, promote quality up-front appraisal data, and reduce post-endorsement appraisal data corrections," HUD said in a statement. The EAD portal will allow transmissions to FHA of only those apprais - als that comply with FHA's Single Family Housing Appraisal Report and Data Delivery Guide. "When submitting an appraisal, the portal provides a confirma - tion of a successful submission, or information regarding required corrections that may need to be made before resubmitting and transmitting to FHA," HUD said.